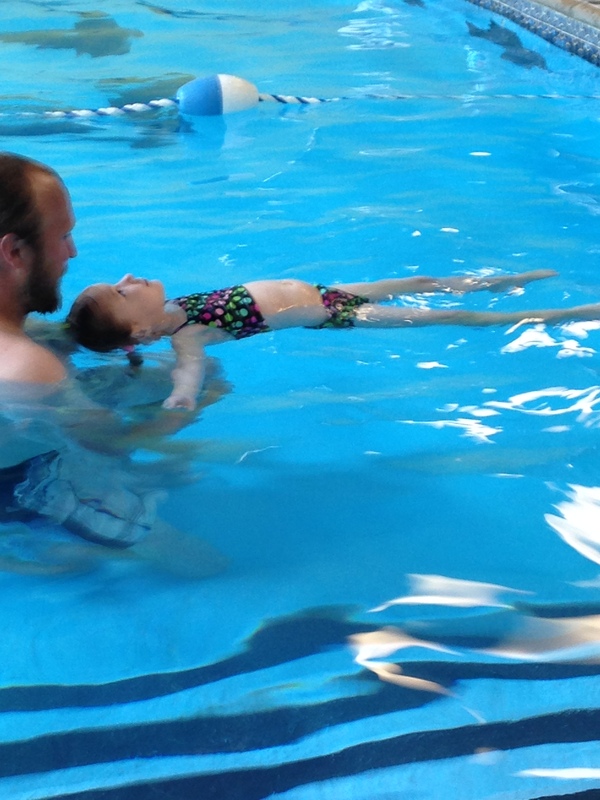 On Wednesday we started private swim lessons for M. She has a male teacher and he was just not letting her get away from not putting her head under the water. He started the very first lesson with that and she was having a tough time with it. She kept looking over at me with her eyes all full of tears she was trying so hard to hold back. It was really tough to watch. But after talking to a few people, I really feel better about it and realize it’s probably better if I just watch from far away where she can’t see me. She started to loosen up after they did some other things that were more fun for her. She wasn’t too crazy about putting the back of her head in to float, but she looks great in this photo! It’s very weird to not have my kids growing up in Florida with regular daily access to a pool where they can learn and practice swimming. I do feel that learning to swim is really important for kids so private lessons might be the way go for us. We’ll see.